I hope everyone in England had a wonderful Bank holiday weekend.. It's been busy, busy in our house with decorating going on.. very tiring! Anyway... for this weeks freebie I have drawn 2 little girls butterfly catching.. It was inspired by a vintage magazine cover back in the 1920's.. I coloured with promarker pens and inked the edges. I hope you like using this image and would love to see what you create with it. Gorgeous image Sylvie, I love butterflies and the girls remind me of my grandaughters who are growing up fast. 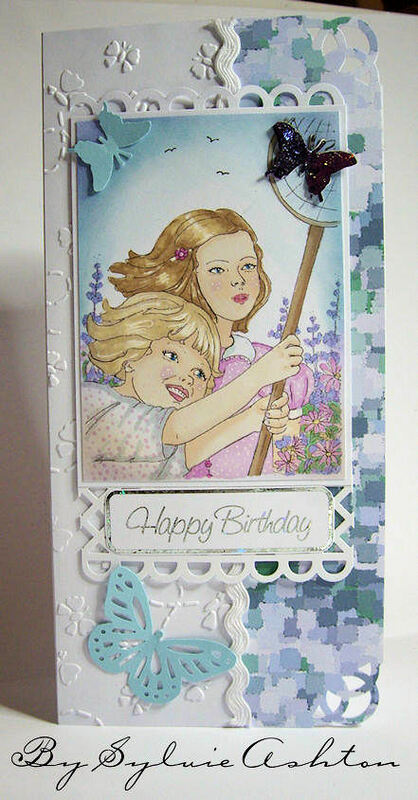 I love the card you have made with it, the soft pastel colours are just right. Gorgeous image, Sylvie, and that card is so pretty! Many thanks. Thank you so much, these girls are cute! Oh I love it, reminds me of my two oldest nieces, I got them bug catching items when they were young. Thanks so sharing! Wonderful image. You do such a great job with faces and expressions. Thank you! I love the image, thanks so much for sharing it and I adore your card, just so perfect! Thank you, Sylvie. This is beautiful! Thanks for sharing! I'm a 'bug' person, no really am - I work with locusts and monitor their movement in southern Africa! Sooooo, love this image - your card too! Thank you for these beautiful girls.They're lovely! Thank you so much...this image is so cute. This is so beautiful! It makes me smile just looking at it. Thank you!